A desktop app that scaffolds projects using Yeoman. Yo, my friend. 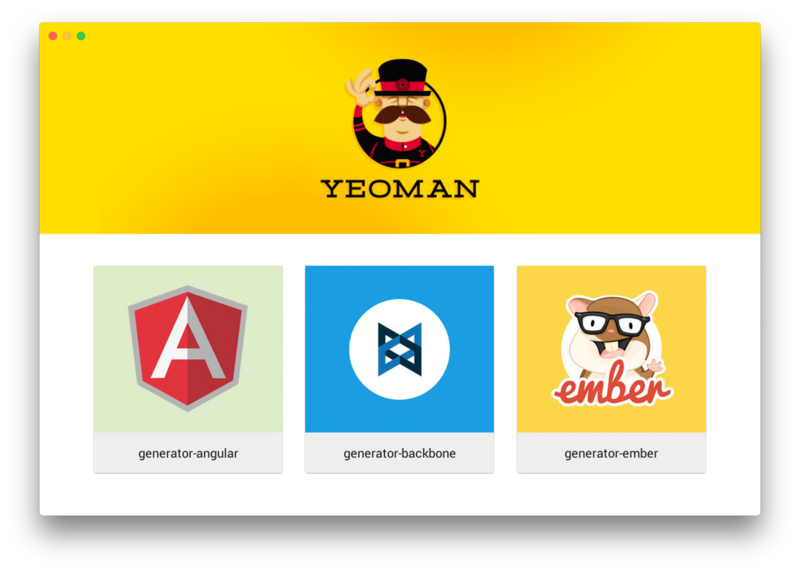 This is the first official Yeoman application with a fresh user interface from 2015. The app is unfortunately still in heavy development and we are looking for help! Let us know if something doesn&apos;t work like you expected by raising an issue or fix it straight away with a PR. The project is based mainly on electron and Material UI. For a Getting started guide, API docs etc. see the documentation page. If something is missing, wrong or unclear, please open an issue. Thank you! We love contributors! See our contribution guideline to get started. To understand how the app is being used we will report usage information to Google Analytics. If you do not want this information reported, you can disable it. Open the devtools with CMD+OPT+I (or CTRL+SHIFT+I on Windows) and execute following snippet in the console localStorage.setItem(&apos;insight.disabled&apos;, true). A unique identifier that is generated by computing the SHA-1 of the machine&apos;s MAC address.